Assembling an omnibus film is a bit like putting together a rock record: Individual “tracks” can vary in quality, but so long as they’re properly arranged, the whole will feel greater than the sum of its parts. Sequencing is key, for most recent example, to the success of Wild Tales, the darkly comic Argentine anthology that’s competing (probably futilely) for Best Foreign Language Film at the Oscars this Sunday. The filmmakers have cannily structured this crazed collection of shorts, using running time and general quality as organizational criteria. The best segments serve as bookends. The worst ones are buried in the middle. Watching the film unfold, it’s hard to imagine it working in any other configuration, though the original screenplay allegedly boasted a different running order. “Get the audience’s attention” is a cardinal rule of both screenwriting and cutting an album, and Wild Tales does not break it. The movie begins on a literal and figurative high note, putting its best foot forward with its shortest installment, a twisted O. Henry prank played at cruising altitude. More than just kicking the movie off with a jolt—and an outrageous freeze frame—this lunatic cold open sets the irreverent tone of the entire enterprise. Presenting six one-act vignettes, most of which double as revenge stories, the film is like a Marxist spin on Tales From The Crypt, minus the horror but not the wicked irony or karmic justice. As with most anthologies, there are hits and misses. One of the wildest of these wild tales pits a road raging yuppie against the “redneck” he antagonizes on a lonely stretch of highway; it’s very much in the key of the Coen brothers (at their most manic) and builds to an inspired punchline. Conversely, a later hit-and-run scenario starts pointed but fails to stick the landing. (It’s not the only segment that peters out instead of locating the proper punctuation.) 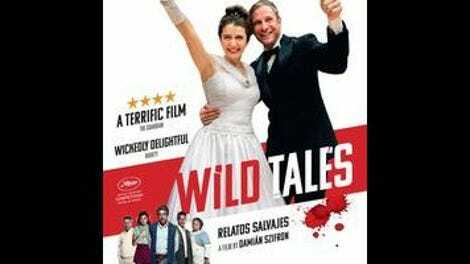 But if Wild Tales is generally inconsistent, in the way most films of its kind are, it possesses an evenness of tone uncommon to the multi-story format. Chalk that up to the guiding hand of a single writer-director, Damián Szifrón, who offers compatible variations on a theme instead of the stylistic hodgepodge of a group effort. He has some of producer Pedro Almodóvar’s flair for melodrama and an action director’s gift for kinetic violence. The energy never flags. Under Szifrón’s stewardship, these self-contained units of savage satire cohere into a singular vision of modern Argentina, a country evidently boiling over with righteous anger. There is, in other words, a social dimension to the film’s farcical mayhem, whose roots are planted firmly in class conflict, a general disdain for privilege, and frustration with government bureaucracy. (The biggest name in the large ensemble cast is probably The Secret In Their Eyes star Ricardo Darín, as an engineer who uses his particular skill set to get back at the parking-law fascists who ruin his life.) None of that rise-of-the-oppressed spirit relates much, though, to the film’s tremendous closing chapter, about a wedding reception gone spectacularly awry. It’s just really funny—and like any skilled sequencer, Szifrón understands the importance of leaving a good parting impression, too. Not that this is the last we’ll be hearing from the guy.